Did you know that hardwood refinishing can bring back virtually any wood floor to a state of near newness in terms of appearance? Many people who have hardwood floors are not aware of that fact. Select Floors in Roswell and Marietta, GA can provide hardwood refinishing services that are second to none in this entire area. Even the very best quality hardwood floors will begin to look dull over time. In addition, it is not at all uncommon for hardwood flooring to become dented, marred, scratched, or scraped from everyday use over time. These blemishes are to be expected, and the good news is that our professional hardwood refinishing services can affordably remove them. The process of refinishing a hardwood floor requires training, experience, and expertise if one wants the best results. Each step of the process, from sanding to applying the final coat of finish, is critical for a satisfactory outcome. No one step is more important than the others, and each must be performed correctly and with care. It cannot be said enough that hardwood refinishing is a job best completed by those who know exactly what they are doing. At Select Floors, we have some of the best hardwood refinishing experts in the area, and their outstanding work speaks for itself. At Select Floors, we use the best materials during your hardwood refinishing job, and this means that you can choose from either oil- or water-based finishes. 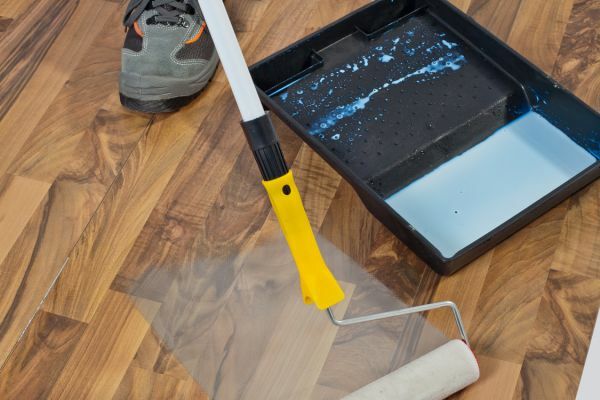 While many of our customers want their floor to be finished to look the same as it was, you also have the option of changing the color tone to achieve a new appearance. Also, during the project, our hardwood refinishing crews use a dust-free system to reduce the amount of dust and debris that is common in all refinishing jobs. If you are thinking of refinishing your old hardwood floor, come by and see us at our Roswell or Marietta, GA showrooms. We can explain the process to you and offer our best advice as to how you can get the best possible results from your hardwood refinishing project.